Stand Up Paddle Surfing: A new flatwater racer: And some hidden surf photos! A new flatwater racer: And some hidden surf photos! 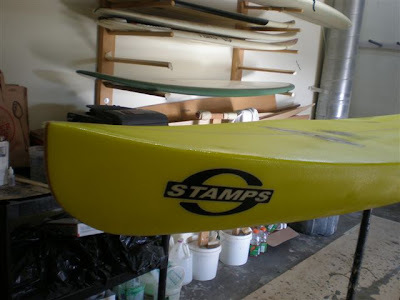 Check out Tim Stamps' new 12'6" racer, just in time for the Gerry Lopez Battle of the Paddle coming in early October. It looks to me like Tim's made a couple of design changes as he moves into his fifth generation of race boards. How about those no-flood footwells? My suspicion is that they lower your center of gravity while still allowing seawater to self-bail out of the footwells. No sense in carrying a couple of extra pounds of water around the course. Check out the new nose design. I call it a "Deadliest Catch" (D.C.) bow because it reminds me of the bows of the Alaskan crab boats featured on the Discovery Channel. I'm going to completely speculate on the thinking behind this feature (which means I could be ridiculously off the mark so bear with me). It looks to me like this bow shape attempts to solve the problem of speed and stability. The problem is that speed and stability don't work well together. The two requirements are at odds in board design; it's hard to make a fast board that's very stable. While speed can come from a number of design factors, one thing is for certain: low rockered boards that cut through water with sharp bows are faster than water pushing, banana rockered boards. There is, however, a downside to flat boards. In moderate chop or swell they don't fit into the curves of the waves around them. Flat boards tend to plow into open ocean swells and can broach, throwing the paddler right off the board. That's why the Hawaiian designed boards are so curvy- those guys are paddling different water than we are here in California, they need all that rocker to fit the open water swells they paddle in. Our conditions are typically more tranquil, we paddle much flatter water sometimes dealing with choppy, open ocean swells spaced closer together. We face a different type of problem set. And thus the our present quandary: how to be flat and fast as well as stable in moderate chop and swell. Which brings us full circle to the bow at hand. The D.C. nose looks to be a fairly high volume design. Higher volume means more buoyancy. Perhaps the idea is that if conditions get messy the boards high volume nose will allow it to resist pearling into the troughs of the waves ahead of it. 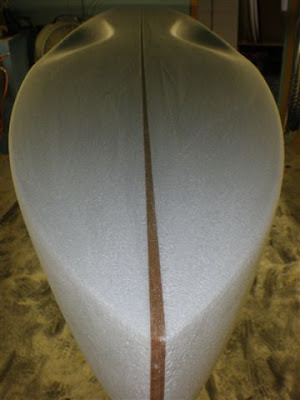 Notice that the volume of the nose is above the bottom line of the boards "keel", thus the board is still relatively flat (read: fast) but still capable of dealing with moderate chop. Hey, if it works in the Bering Sea it may just work here. I'll guess we'll just have to wait until October to find out! Remember these days? Mid-June, seventy degree water, steep south swells and perfect sandbars.... FEED ME! Enjoy these photos I found hidden on the hard drive.